Carnotite belongs to the group of uranium (U) radioactive micas is a vanadate of potassium and uranyl. Glance (glitter, glare) dim (in earthy the masses), mother-of-pear nacreous on the planes of cleavage; transparent to translucent. Colors: canary- or lemon-yellow, gold (bright and enough eye-catching). Fracture, break step, uneven. A radioactive yellow mineral consisting of hydrated uranium potassium vanadate: occurs in sedimentary rocks and is a source of uranium, radium, and vanadium. Formula: K2(UO2)2(VO4)2.3H2O. Cleavage very perfect absolute; strongly radio-active. Be found as dispersion, dissemination in sandstones (therefore dangerous), sometimes forms raids and crusts. Oxidate palasomes of uranium and vanadium. Crystals (monoclinic Crystal structure) are shallow, usually badly formed, more frequent earthy and triturate the masses. 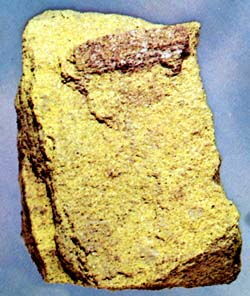 Important ore of uranium and vanadium. Deposit minefield mine field occurrence subsoil: in the USA (state of Colorado), Canada, Mexico, Morocco, Shabe (Zaire), to Australia. Naming after the French mountain engineer and chemist M.A. Carnot. Carnotite extraordinarily rarely forms crystals, having a plate tablet lamellar look and small sizes. Usually he is presented triturate the masses or disseminations of bright-yellow color in sandstones in the states of Colorado, Utah, Arizona and New Mexico ("Plateau of Colorado"), where they form the deposits of large value. Horrific lethal radio-active imitator of yellow poisonous sulphur (S) and its volcanic fumes - extraordinarily look like sulphur (S) and realgar (arsenic). Without a dosimeter, befitting is forbidden - radioactive and dangerous for men. A mineral is refractory, but dissolves in acids; radio-active. Carnotite not collect. Be found in siltages, in which deposited waters, enriched uranium (hydrothermal). Outside United States of America (USA) Carnotite present on the deposits of analogical type. Foremost, it is Middle Asia of the CIS (Uzbekistan, Turkmenia). Found out good crystals in rose sandstones of province of Shaba (Africa, Zaire). In Australia, on the deposit of Radium-khill there is a raid of Carnotite on Davidite, being a product of change of the last. 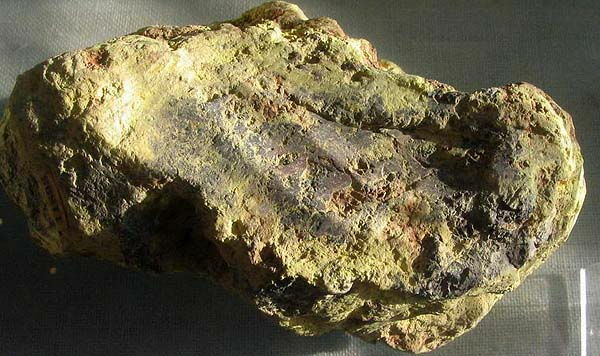 Carnotite - one of main ores of uranium and vanadium. 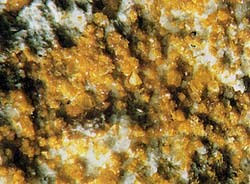 Carnotite. Longum-Park, Uravan Distr., Paradoks-velli, district of Montroz, Colorado, USA. An ore district of Uravan is a place of opening of Carnotite. A photo: © A.A. Evseev.